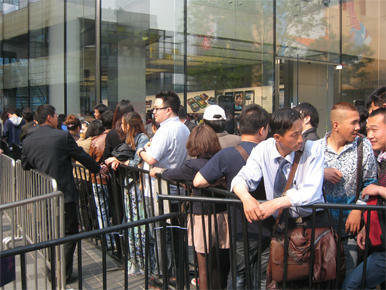 Hundreds Wait in Line For The White iPhone 4, Would You? We’ve come to expect a good line outside Apple stores when it comes time for new product launches, but what about for the launch of a new color for an existing device? According to MacWorld, hundreds of customers lined up outside Beijing’s Apple store this morning to get their hands on the white version of the phone. Many of the customers in the line claimed to have been holding out to purchase an iPhone 4 until white was made available. Does gadget color mean that much to you? While I know that I definitely would have a preference one way or the other if given the option (I own a black iPad 2 for instance, rather than a white one), I can’t imagine holding out indefinitely to buy a device until a specific color was available. Maybe if the delay was a few weeks, but the white iPhone 4 has been delayed almost a year now- that seems a bit extreme when it comes to gadget wait times just to get a specific color – a color that will more than likely get much dirtier than its black counterpart. What do you think about the lines for the white iphone 4? Did any of you wait until today to buy an iPhone 4 simply so you could get the white version?